As pointed out by Greg 0., Mystery Foto #9 has already been reviewed without a definitive answer back in 2013. We will leave that Mystery Foto open, but will also provide a new challenge this week. The #6 Darracq driven by Louis Wagner and his mechanician Ruillet. The #18 Darracq driven by Victor Hemery and his mechanician Victor Demogeot. The Victors were "victorius" in the race capturing first place. -What is the approximate date of the photo? 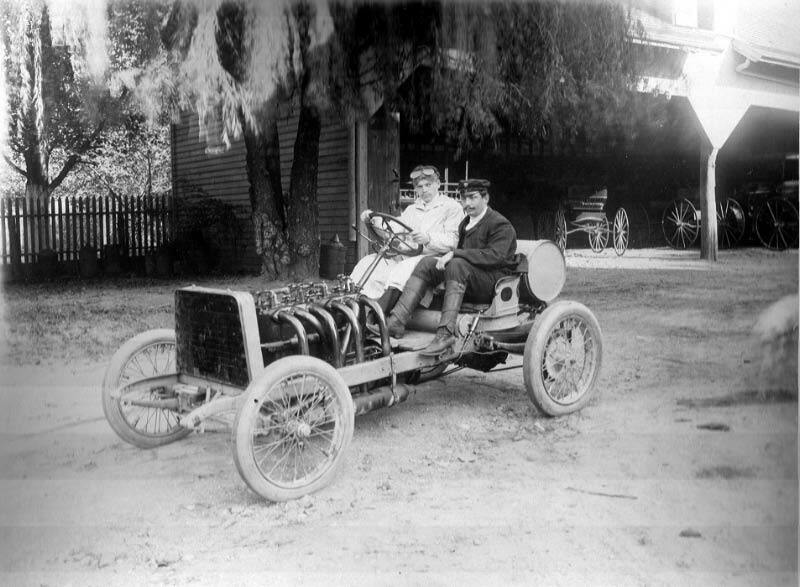 The photo was likely taken prior to the race from October 1, 1905 to October 13,1905. -Where was the team headquarters located? 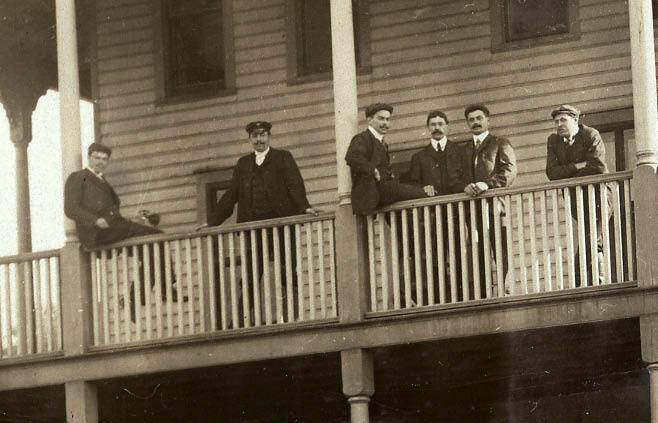 The photo was taken at the Stone Gate Cottage of the Hotel Glenwood, whose proprietors were Karatsonyi & Kmetz. 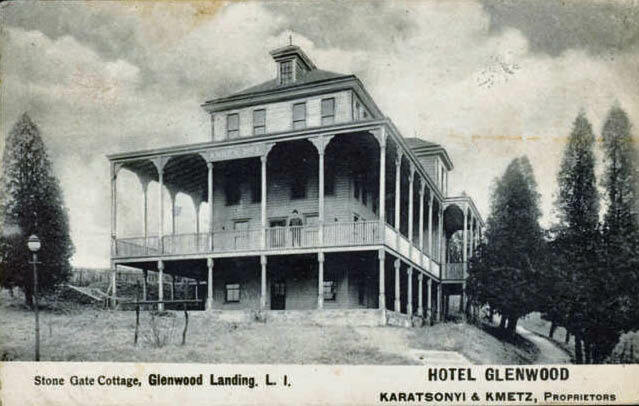 This building was part of the their 27-acre hotel complex which became known as the Hotel Glenwood-Hungaria and the Karatsonyi's Hotel. 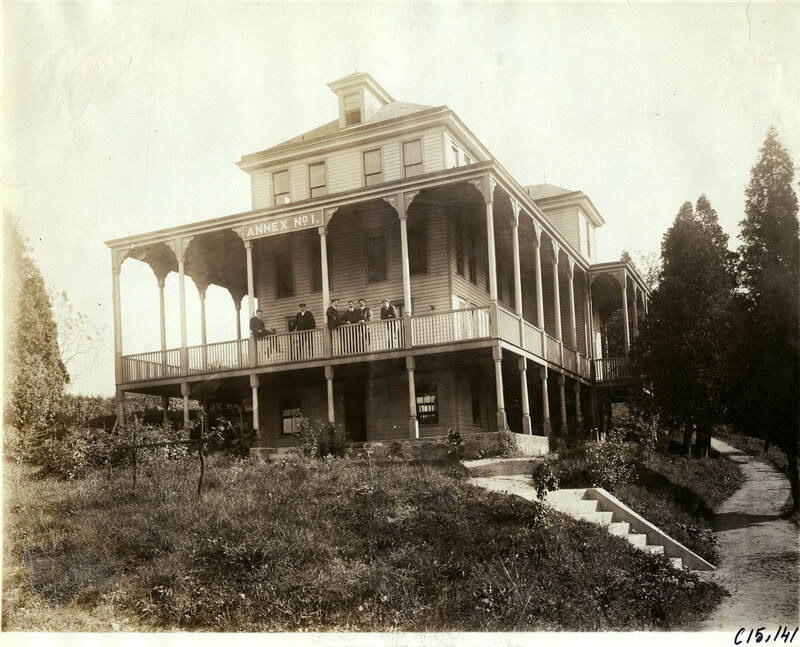 "The property was sold to LILCO about 1950 and the old hotel was torn down. The peaker plant (the one they built about 2000 is located where the hotel was.) The two parcels south of Tappen Beach which are behind chain link were the Karatsonyi's beach until Lilco bulkheaded and filled in the beach. Very sad. Now it is legal limbo due to pollution from the Glen Head Plume. Karatsonyi was a Hungarian and a major NYC wine importer. 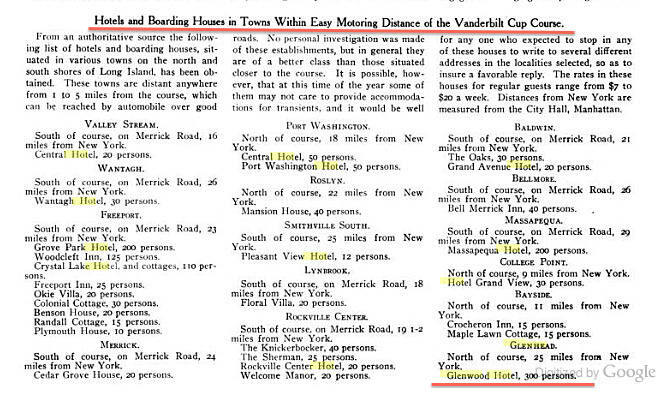 He bought the former James Mott farm (Quakers from Westbury) and turned it into a hotel. At one point, he planted 1000 grape vines and used goats to keep the undergrowth under control. It was a huge place and they could handle a couple of thousand day trippers - it was very popular for company outings. There were something like 8 or 9 baseball diamonds, the beach, restaurant, a steamship dock." 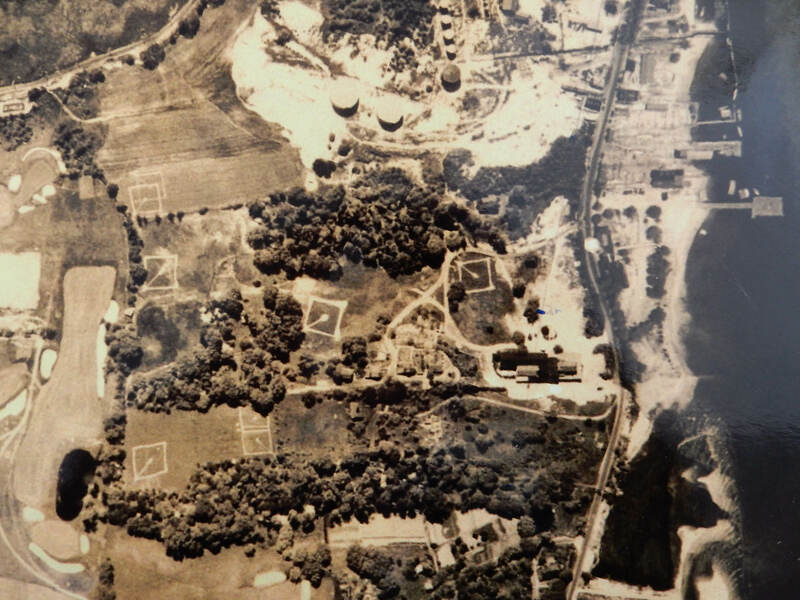 Congrats to Greg O., Jerry Helck, Frank Femenias, Ariejan Bos and Art Kleiner for identifying sections of the Mystery Foto. Kudos to Greg O. and Art Kleiner (see Kleiner's Korner) for correctly answering all the Mystery Foto questions. Special thanks to Sally Sotirovich for her great insight! Victor Hemery and Victor Demogeot at the Glenwood Hotel garage. 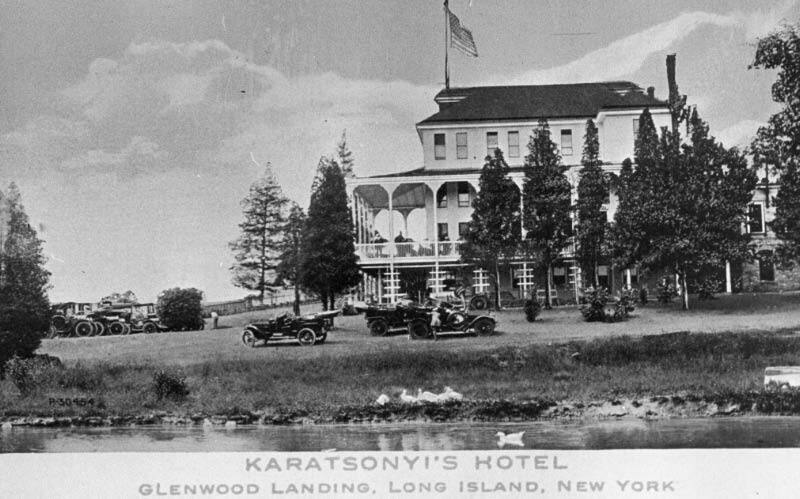 The Karatsonyi Hotel complex was 27 acres locared on Shore Road, adjacent to the North Shore Country Club and north of Glenwood Road. 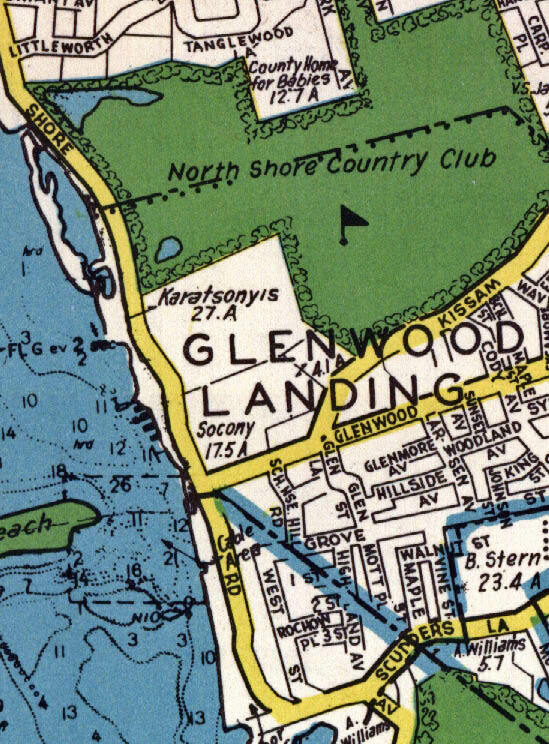 Source: Dolph's Atlas of Nassau County-1939. 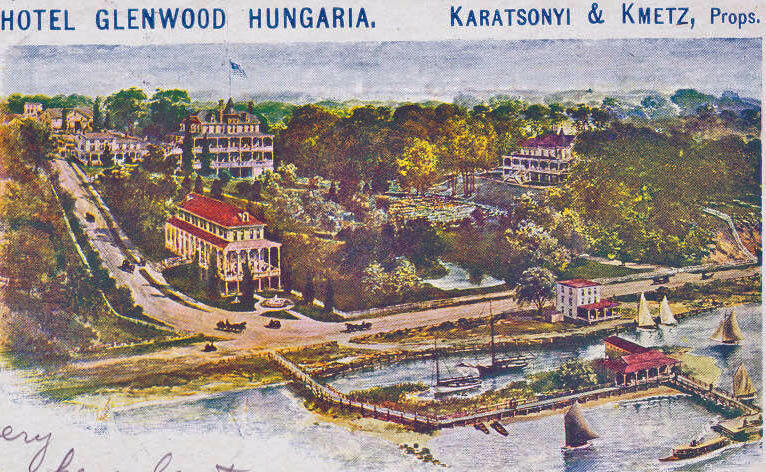 A 1926 aerial of Glenwood Landing and Karatsonyi's Hotel. Check out the number of baseball fields. Courtesy of Sally Sotirovich. 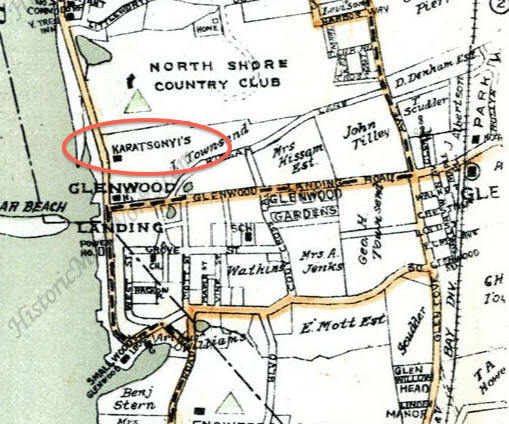 The North Shore Country Club golf holes have not changed since 1926. Unfortunately, the Haratsonyi property have significantly changed. An exact match with our Mystey Foto! In this postcard, the "Annex No. 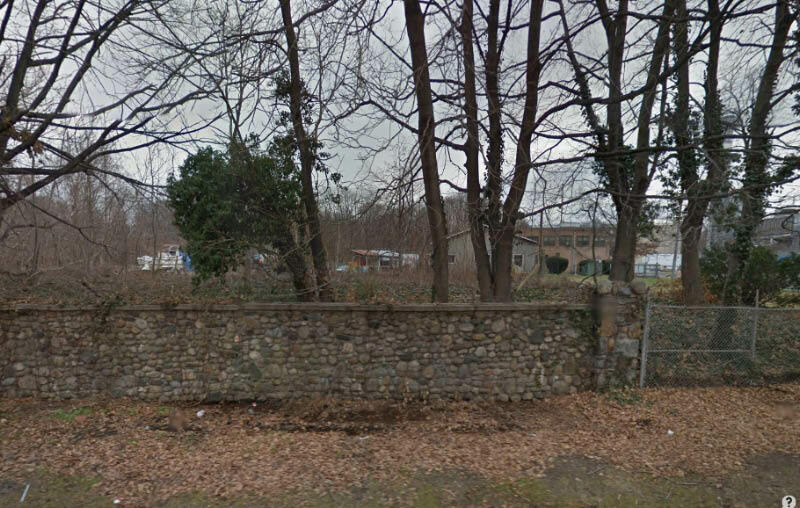 1" building was called Stone Gate Cottage. Courtesy of Long Island Memories. The view looking east from Hempstead Harbor. The Stone Gate Cottage was on the left. Look closely and you can see the"stone gate" in front of the cottage. 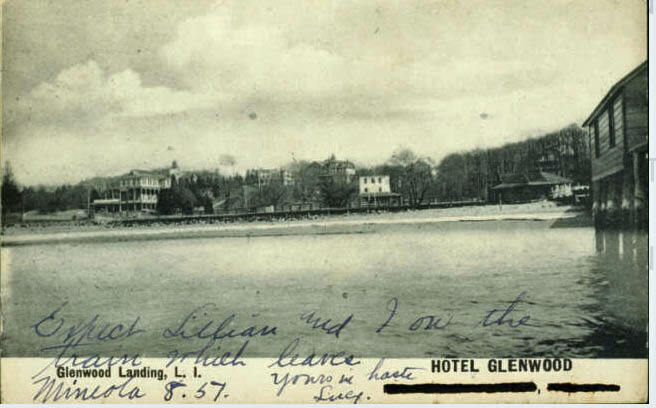 This postcard shows the size of the entire complex called Hotel Glenwood Hungaria, reflecting the Hungarian heritage of the owners. The Stone Gate Cottage can be seen on the left. 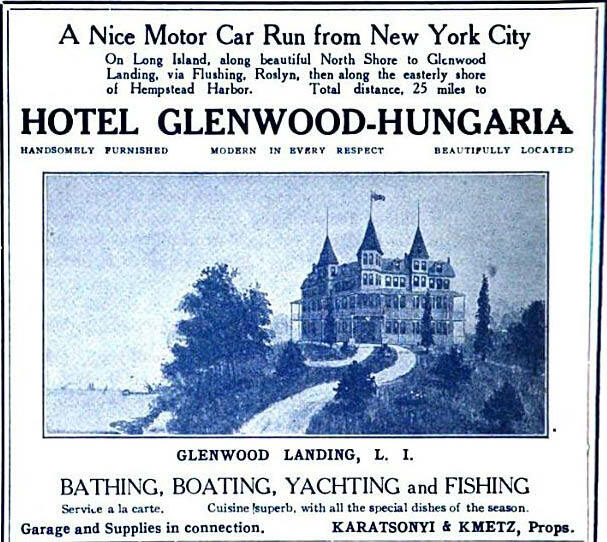 A 1906 ad for the Hotel Glenwood Hungaria. 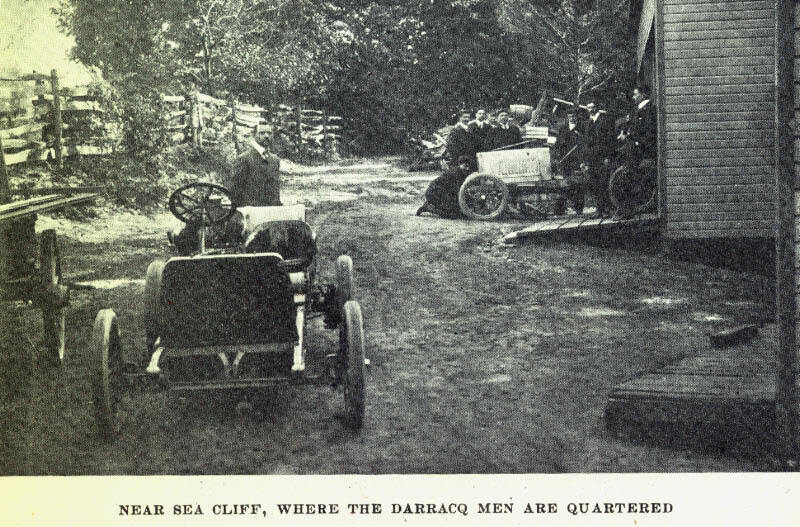 The Darracq team returned to the hotel in 1906. Courtesy of Walter McCarthy. A Google Earth aerial of the former Karatsonyi property. The stone gate of Stone Gate Cottage is still standing! 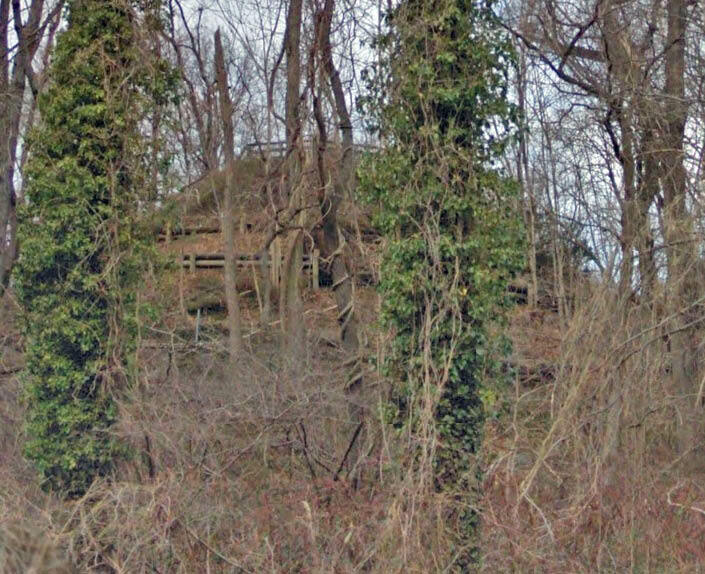 This abandoned fenced-off overlook was likely part of the hotel complex. Hello Howard. Is this current mystery foto somehow related to mystery foto #9 from 2013? If I you don’t see this question before Monday, I’ll email you. Well, with that hill, it sure wasn’t Savannah! To me, the 3rd person from the left looks like Louis Wagner. If that’s true, it must be 1905 or 1906 and the other people are presumably part of the Darracq entourage. 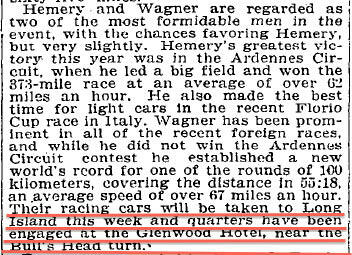 That’s the French Race Team on Long Island for the 1905 Vanderbilt Cup Race so the date would probably be around the first 2 weeks of October, 1905. 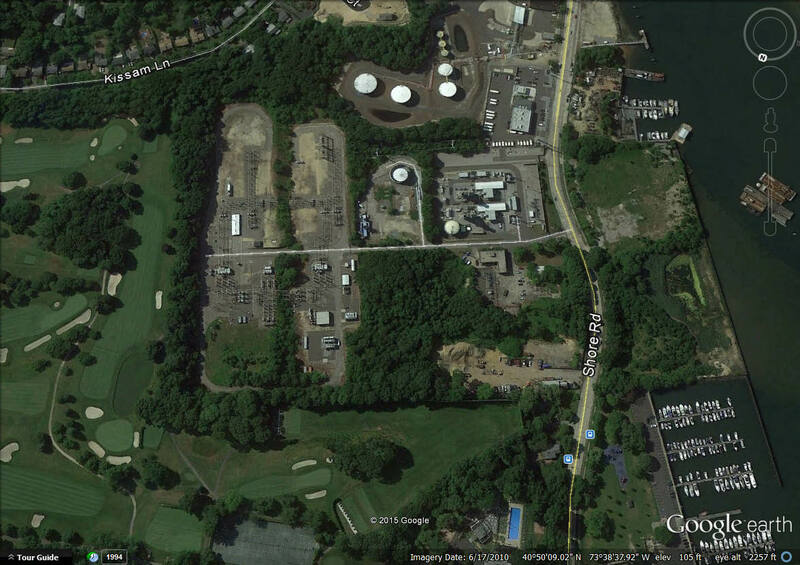 As to location, just a wild guess but someplace on the north shore of Nassau County, maybe Glen Cove or Seacliff. 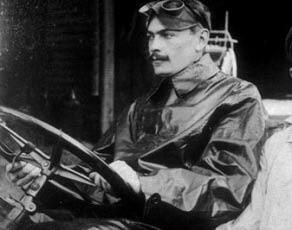 The 1905 French Darracq & Company racing team (Cup winner, Victor Hemery and second place finisher Louis Wagner). 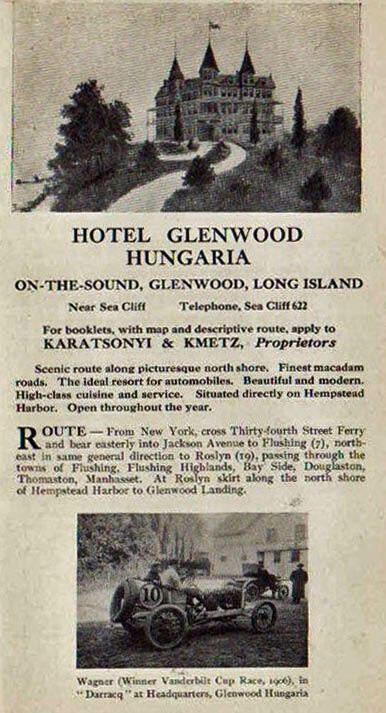 Hotel Glenwood Hungaria in Glenwood Landing. Owned by Karatsonyi and Kmetz. More information and pictures to be sent to Howard separately about this location. This the French team competing in the 1905 Vanderbilt Cup. 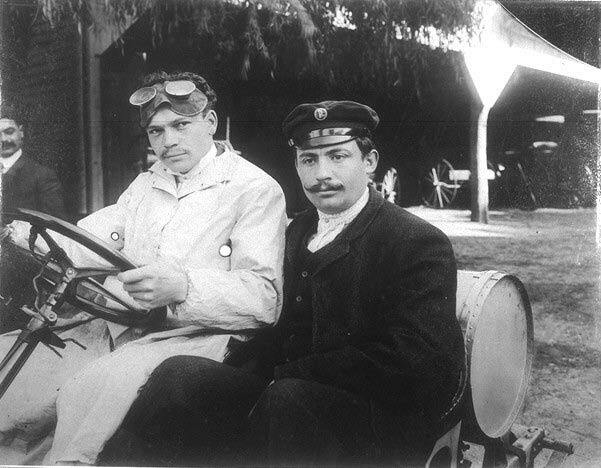 Six persons, so they could be the fully ‘French’ equipes of Lorraine-Dietrich (Arthur Duray with mechanician Franville), Renault ( Ferenç Szisz with Dimitrievic) and Darracq (Victor Hémery with unknown mechanician). Unfortunately the quality of the photo is insufficient for good recognition, but the person on the far left could be Hémery and on the far right Duray. Thanks for those links Frank. You thought I forgot about you guys, never happen, been busy lately, don’t have much time to keep in touch. Wow. Being a former Lilco employee, I’m familiar with the substation property that pretty much covers the area of the former Karatsonyi property. Just had no idea of the history here. It’s good to learn something new, thanks guys. 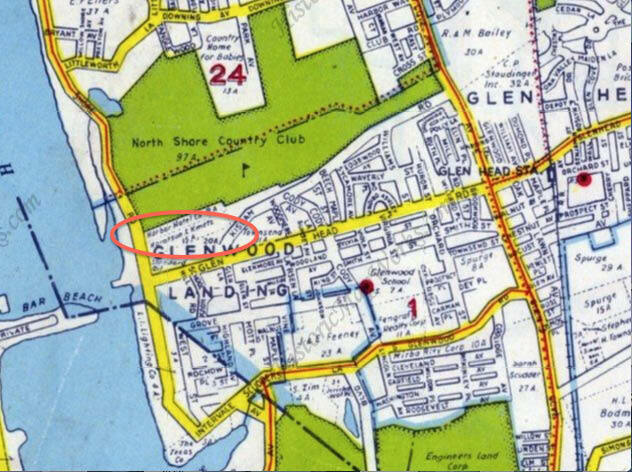 The 1926 aerial is a gem..Shore Rd is obvious. I’m thinking the curved road in the upper left corner is Kissam La. 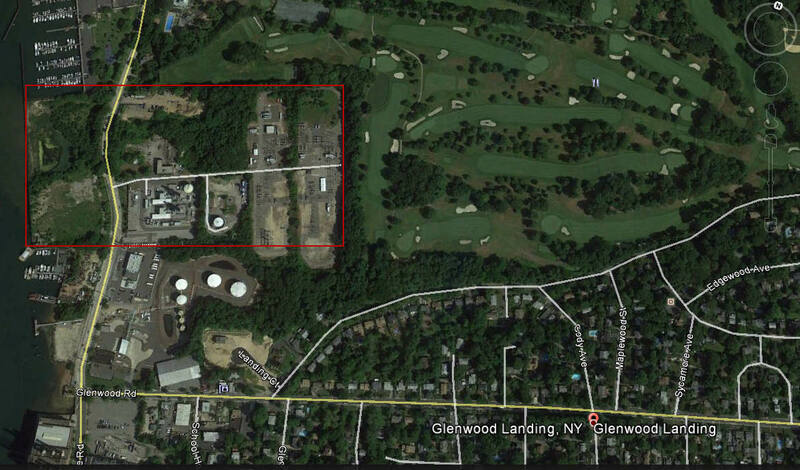 When I was working in 2012, the Glenwood Power Plant was beginning being decommissioned. Sam III, a small section of Karatsonyi’s Hotel bordered on Kissam Lane. 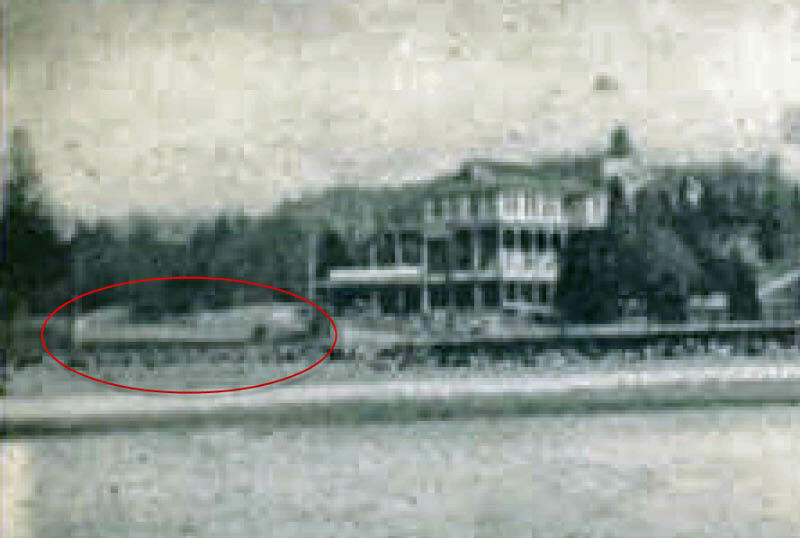 The hotel’s overlook is still there.